Have Fun With Foosball Tables! Table soccer has been a popular game for several years. These tables can often be found at places that cater to gaming and family restaurants. If you have a deep love for foosball, then the odds are you’ve been searching for months to find an affordable model and one that can handle some tough wear and tear. Not all foosball models are created equal, but this table from Hathaway has a different player setup than what you’ll be used it and it has a lot to offer in terms of low pricing and overall durability. The Hathaway Foosball Table like most foosball tables, is made from MDF. What makes this model stand out from the rest is the quality of the MDF. Instead of the type of flimsy material often used for foosball construction that uses MDF that’s only 5/8” thick, the MDF on this table is one inch thick. Solidly built, this table can handle hours of play. This is a full sized table that offers more realistic gameplay and its overall durability is what makes this such a popular model. The spinning rods on this table are made from solid steel, which only adds to the durability. This model weighs in at a hundred and thirty pounds, which is the perfect weight to ensure stability. When a foosball table is too light it can tip over during rough play. This will not be an issue for the Hathaway because it’s designed to withstand aggressive games. The stability of the table is also important because it can affect the levelness of the playing surface. This model also features levelers on each table leg, which makes it easy to level out the playing surface, giving every player an equal chance to win. When a table is well adjusted it will remain leveled regardless of the type of surface it’s placed on. The surface of the table measures in at 3/8” thick. SOLID, DURABLE CONSTRUCTION - Quality design means quality performance. Solid steel rods glide smoothly through fast, E-Z spin bearings. The coated, cross-supported surface guarantees a quick and even playing field. ALL THE ACCESSORIES YOU NEED - Start playing the day it arrives. Includes easy grip wood handles, quality molded players, silver-toned analog scoring units and 2 foosballs. Also comes with an easy-to-read assembly manual. MONEY BACK GUARANTEE - Your Primo comes with a 180-day manufacturer warranty. We promise that it will arrive damage free with all necessary parts and accessories. Otherwise, we'll send replacement parts or an entirely new table at no cost to you. The solid steel rods are perfect for intermediate players. The rods don’t spin as fast as hollow rods do, but for beginners or intermediate players who only require medium speed, these conditions are ideal. Most American models come with three goalies for the final line, but this model only comes with one. However, this model was made in China where a one goalie setup on the last line is fairly common. This actually works to make the game more challenging because it requires a lot of skill to work with just one goalie, which means this setup may be difficult for beginners. A common issue with many foosball tables is that they don’t come with adult-sized features, so what you’ll end up with is a table that’s more designed for kids. But this prime soccer table is designed with adults in mind. For many consumers, foosball tables aren’t just gaming equipment, they’re also a piece of décor. Of course, this table is the perfect addition to any man cave but it’s also a model that you won’t mind displaying in your living room. The table’s espresso finish is complemented by the stainless steel trim, resulting in a gorgeous table. But this table isn’t all looks, it also offers excellent play. Your typical foosball table features eight rods which control the soccer figures and a goal at each end of the table. While most tables are equipped with two or three goalies, as we have mentioned, this model only comes with one. This can be a bonus if you’re looking for a more challenging game or it can be pretty frustrating if you’ve never played table soccer before. Each player will use their set of handles to move their men to hit the ball into their opponent’s goal. You’ll also defend at your left and go to your right. This model is cleverly built to provide different kinds of rods that feature different spacing between the players. The game is fun and fast and your family can enjoy a little competition or some much-needed family time. The objective of the game is to use your players to shoot and pass the ball into the goal while also using your men to prevent the ball from falling into your own goal. You try to score, you pass it and you serve it. With the lack of goalies, it will definitely take even the most skilled player some getting used to. Pros: Very stable, this model offers challenging gameplay on a table that offers a realistic feel and a stylish look. The easy leveling helps to improve the play experience. Cons: The soccer players are made from plastic instead of steel, which might be an issue later down the road. The ball bearings are also made from plastic instead of steel. While the table is both thick and heavy and able to handle rough play, it’s still more susceptible to damage compared to other models that use steel or wood components. Some consumers complained about the assembly process which can take hours, especially considering the included instructions are very vague. One consumer stated that the table took almost four hours to assemble, however, all of the parts are labeled which definitely makes the process easier. The nuts and screws are also packaged separately and clearly labeled. Other consumers mentioned that the screws used for the table need to be tightened frequently, especially after each game. 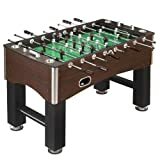 If you’re searching for a more traditional model and one that can also withstand heavy use, consumers recommend purchasing the Kick Triumph Foosball Table. For a budget model, the primo foosball table holds up well. Players at the intermediate level will definitely find playing on this table challenging. Because of the one goalie design, it’s really not recommended for beginners. The plastic feel of some of the components really takes a lot away from the table’s overall quality. Consumers who purchased Hathaway Primo Soccer Table gave it a rating of four out of five stars for pricing, innovative design, the leveling feature and the thickness of the playing surface. Check out more reviews of top-rated foosball brands on the market. Tornado Foosball Table Review | The Game For Soccer Lovers!